The duo, Hitoshizuku and Yama△ once again is back, bringing along another story-driven song to the Vocaloid fans. A song of fantastic mystery involving the Diamond and the Phantom Thief F.
Click for more details and translation as provided by vgperson. To those who does not know, these two VocaloidP, Hitoshizuku and Yama△ are most famous for their collaboration work, especially the Synchronicity and Bad End Night series. Their collaboration are mostly done with Hitoshizuku composing the music while Yama△ doing the mixing. Individually though, Hitoshizuku is more known as the female composer who are skilled with piano and telling story with her songs. 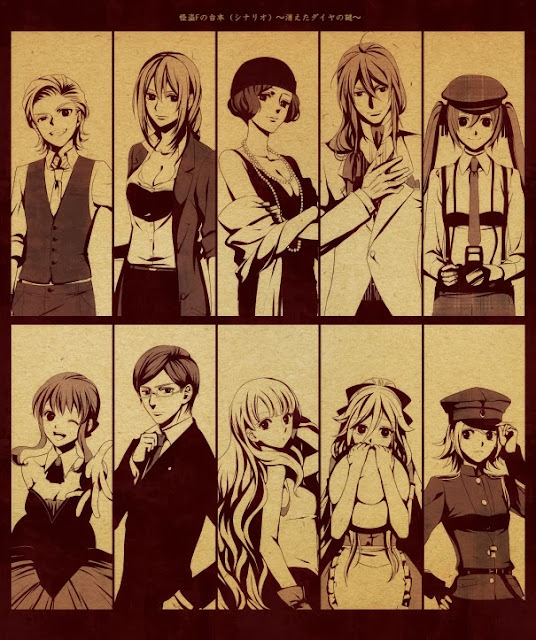 She is also coined as Legendary LEN Master' in several of her works such as Soundless Voice, and Kimiwo Sagasu Sora. Yama△ on the other hand mainly utilize Luka's mature voice in his metal genre as well as ballad where some might be familar with his work entitled Yakusoku. Together, their collaboration are often known as Hitoshizuku-P x Yama / ひとしずくP x やま△ or Yamashizuku / やましずく. With regard to this introduction song to perhaps a new series, the duo not only used 8 Vocaloid like they did in Bad End Night, but added two more, which are Mayu and IA, to the fray. Each of them as usual have their own roles as shown in the picture below. 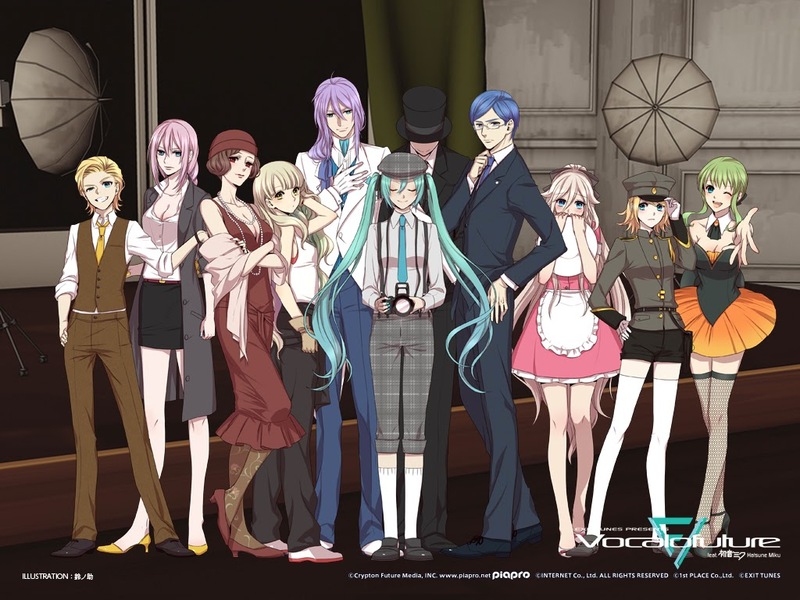 From the left we will be having a Mafia (Len), the Doctor (Luka), the Actress (MEIKO), the Auctioneer (Gakupo), the young Journalist (Miku), the Magician (GUMI), the Politician (KAITO), the Mechanic (Mayu), the Waitress (I.A) and the Police (Rin). So far from this first song, it start off with a challenge letter by the 'Phantom Thief F' to stole a precious diamond during an acution in a cruise. 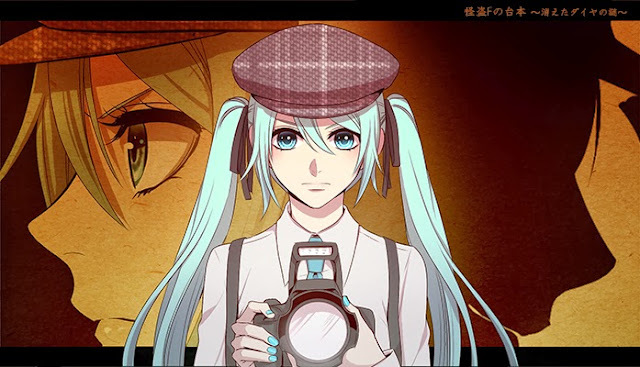 The event that taking place will be told from Miku's perspective as the journalist. In short, its a mystery theme this time, to guess....who is the 'Phantom Thief F'? Picture and illustration is done by Suzu no Suke while the animation is collaboration work between TSO and VAVA. The song will also be featured in the upcoming album from Exit Tunes entitled [EXIT TUNES PRESENTS] Vocalofuture feat.Hatsune Miku. You can PO the album from CDJapan or at the official page's store. Also if you go the official website, you can download free posters and illustration of the song with other illustration, such as this one below. Well let not waste time no longer, and enjoy the good music. Are you ready for another wonderful ride to fantastical story? Guuzen todoita tegami wa nanto Fantastic!! Toori de mafia ni karamaretera rashii? Kaishi jikoku ga wazuka ni oshiteiru? Wain o koboshita seijika wa douyara nebusokugimi...? Tonari no isha ga "o-kusuri o douzo" to...? Ottori ueitoresu wain ni shanpan susumeru mo...? Joyuu wa uisukii rokku o tanonda? Gouyoku zairyoku shuutai chitai buchimake paatii? Juu-byou hodo de teiden ga kaifuku guuzen no toraburu? Juusei wa doko kara kikoete kita...? Tenimotsu kensa torenai! Ashimoto ni korogatteiru dangan wa dare ga nan no tame ni nani o utta no ka? Genkai taisei hannin sagashi hitori yukuefumei nan dattee?! Mado o kowashite kanpan e? Ume e tobikonda no ka? Saizenretsu de subete o miteta kimi ga michibiite? A letter that arrived by chance - how Fantastic!! It seems he got involved with the mafia behind him? Onto the Fantastic phantom's show - shall we begin? Let the truth be exposed through my Finder! The magician's sideshow; does her performance carry an omen? Is the starting time being slightly pressed? The police - is she tense with rigorous caution? Is she glaring at that rowdy mafia? The politician spills his wine - might he be lacking sleep...? The doctor beside him says "Have your medicine"...? The gentle waitress recommends wine with champagne, and...? The actress asked for whiskey on the rocks? Ahh, by all means, an impossible crime - shall we begin? Greed, assets, disgraceful foolishness - a party where all is laid bare? In ten seconds, the power's back - just a random accident? Where did that gunshot come from...? That wasn't in luggage inspection! With a bullet at her feet - now who shot it, at what, and for what? The guards search for the culprit, one person unaccounted for - Say what?! Broke the window, jumped out on the deck? Dove into the sea? phantom songs-Download Latest Movie All Is Well 2015 Songs. All Is Well is directed by Umesh Shukla, Music director of All Is Well is Mithoon, Himesh Reshammiya, Amaal Mallik & Meet Bros and movie release date is 21 Aug 2015 . Download All Is Well mp3 songs which contains 6 At SongsPK. calendar girls mp3 songs-Download Latest Movie All Is Well 2015 Songs. All Is Well is directed by Umesh Shukla, Music director of All Is Well is Mithoon, Himesh Reshammiya, Amaal Mallik & Meet Bros and movie release date is 21 Aug 2015 . Download All Is Well mp3 songs which contains 6 At SongsPK. latest video download-Find out latest YouTube video songs and download youtube video for free as mp3 at musicnoow.com.MusicNoow is best way to find out latest youtube video songs. Visit us and download your favorite songs for free right now.